Just after 6 am on Sunday, February 18, 1996, fire broke out at the Hotel Washington. Fire crews arrived at the scene at 6:28 AM, but the building was largely gutted. Encompassing the American journey for civil rights, this geographic litany was cited by President Barack Obama in his second inaugural to stir the hearts of Americans. Frank Bruni, in his column in The New York Times, calls these locations “A Map of Human Dignity.” For those not who are not historians—and for the younger among us—they might not be totally clear references. In 1965, Selma was the beginning point for the much-harassed march to Montgomery, Alabama, that state’s capital, to ensure voting rights for African Americans. It inspired a nation, with clergy from the North joining Martin Luther King, Jr.’s Southern Christian Leadership Conference in the effort. Among those was white Unitarian Minister James Reeb from Boston, who, beaten with clubs and refused hospital help, died in Alabama. Today, a Madison church is named for Reeb. King said what we seek is “a society that can live with its conscience.” As an undergraduate at the University of Dayton that year, I organized a supportive demonstration for Selma in front of the campus memorial to John Kennedy (though I could not call a demonstration on the quiet Catholic campus but had to term it a rally). Stonewall was a gay bar in New York City where patrons, many drag queens and transgendered people among them, fought back against persistent police harassment in 1969. So a political convention, a prayerful march, and a gay bar are today’s icons of equality. Why a gay bar? That’s what we need to think about. Nineteenth-century visionary reformers in New England and upstate New York frequently had assemblies with speakers for good causes. A whole book entitled Freedom’s Ferment described the early 19th-century efforts to expand democracy’s vision. It was a familiar venue for the polite middle classes for issues from abolition to prison reform. So why not women’s rights at such a venue? For African Americans, the black church has been a key institution. The nation’s first free black community developed in Philadelphia in the late 18th century, and black churches were among the first institutions they created. Prior to the Civil War, the black churches were among the earliest groups petitioning on slavery issues. So the role of the black clergy in leading the Southern Christian Leadership Conference was indeed traditional. Why would a gay bar be the place to commemorate a movement for gay rights? I want to draw in part on Wisconsin’s own historical experience to explain the singular appropriateness of the locale. In the 1940s, homosexuals in Wisconsin had begun to gain visibility. 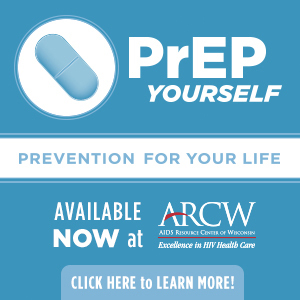 Academic research at UW-Madison studied 21 homosexual servicemen at Truax Field at the end of World War II whom they characterized as “definitely aggressive in their homosexual activity.” It showed that the common meeting place for gays was the capitol square, because they did not have their own places. 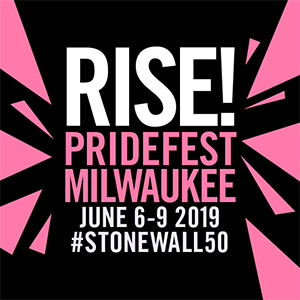 A Milwaukee study during the same war discovered that homosexuals, found to number in the hundreds, used the city’s theaters for meeting places as, again, they did not have their own spaces. Though they had created networks, sometimes even termed clubs, for communication, they had not created gay places. In the later 1940s and 1950s there is good evidence that certain houses in Madison had become centers of gay social activity. A 1948 police raid uncovered a near West Side home that was a locus of gay parties. A 1951 article, written in code, describes the artistic social circle that revolved around the gay couple who lived in the house that I now own. But these were private places, not necessarily open to all. The first public places for the community were gay bars. And they emerged, they became a topic of discussion. In February 1958, ONE, the homosexual magazine published on the West Coast, had a cover article on “The Gay Bar.” Author Robert Gregory noted, “The Gay Bar, while it by no means offers a total cross section of the homosexual population of a city or country, nevertheless goes farther, at present, than any other single social institution in collecting together a wide variety of types and temperaments.” He cites Helen Branson’s recent book on her operation of a gay bar. A contemporary treatment of Branson’s account is presented in Will Fellows’s book Gay Bar: The Fabulous, True Story of a Daring Woman and Her Boys in the 1950s. Edmund White, in his 1980 book States of Desire: Travels in Gay America, observes that often for the Midwest, “Gay bars are gay life, they believe. In a bar or a bed a man might be gay; otherwise he is straight—a person just like anyone else. The notion that affectional preference, sexual appetite, shared oppression might color all of one’s experience eluded them.” He also has a quote on Milwaukee being a “bar-oriented” town. The earliest places for gays in Madison were bars around the square, often associated with hotels where visiting men might be found. These were not yet gay bars, but places where gays would be tolerated. By the early 1960s, gay guides about Madison had six gathering spots for gays, and there were twelve in Milwaukee. One of the early popular Madison places that appeared in the 1970 gay guides was the Pirate Ship, with full swashbuckling décor, though it was gay only part-time. The owners Rodney Scheel and his brother Greg went on to create the Hotel Washington entertainment complex with several gay bars and the Café Palms, a delightful late-night eatery. Bought in 1975, was expanded with an outdoor deck and a new dance bar addition. The Hotel burned to the ground on Feb. 18, 1996. Its central place in the affections of the gay community was shown in two events, both of which I attended—a memorial at the campus Methodist church and a rally at the state capitol. His memory lives on the Rodney Scheel House for PWA/HIV. The community losing precious spaces was all too familiar. In 1977, Lysistrata, a restaurant with a bar and performance space, opened at the corner of Gorham and Broom Streets. The feminist board of the Lysistrata Cooperative included many known lesbians in the community. It was a central gathering space for the womyn’s community. The space also welcomed men, though, as I attended community political and fundraising events there. The Madison police and fire departments used the location to recruit women, many of them lesbians, as they diversified their forces. On January 8, 1982, the building containing Lysistrata burned down to a great sense of loss. In the Lysistrata case, arson was suspected (this was not the case with the Hotel Washington incident). 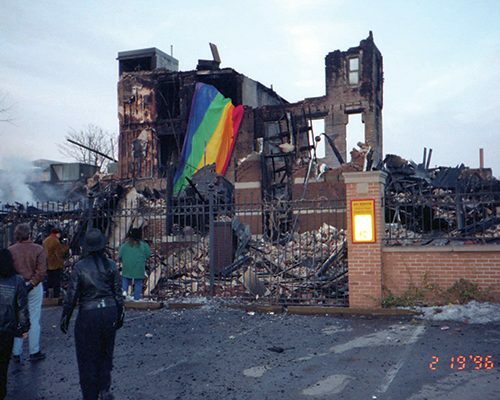 Another gay bar in La Crosse also had burned down in 1977, and again arson was suspected. Anyone hear echoes of the burning of black churches across the South? While the broader straight community deplored the fire losses in Madison, they did not really comprehend that true institutions, once part of the very soul of the gay community, were no more. Today, gay bars still play important roles as community institutions in Madison and around the state. For example, on their website, FIVE nightclub has an excellent list of links to community organizations. WOOFs works with a variety of gay-friendly sports groups, sponsors its own block party with Woof Pride, and has sponsored a MADD DAWGS team for the AIDS Ride. Sotto and others provide prizes for AIDS Network’s Camp Bingo. One of the most ambitious bars with a community event is Plan B on Williamson Street. They’ve joined in the tradition of the Marquette Neighborhood’s round of citywide-appealing creative summer festivals (think Waterfront Festival at Yahara Park, Fete de Marquette in the rail corridor, Orton Park Fest in the named park, and the Willy Street Fair on the nicknamed street, all of which Plan B also supports). To the festival roster, Plan B has added the rainbow-tinged Fruit Fest. The new summer music festival also has a 5K run/walk called the Fruit Loop with a route through the neighborhood. This past year, it was the summer site of Camp Bingo. The Greek origins of the word philanthropy mean lovers of men—in order to do them good. Gay bars continue that tradition for our community with their good works. Some of us today may not have connections to historic places that shaped American liberty such as Lexington, Concord, and Yorktown or Antietam, Gettysburg, or Shiloh. Few of us may have marched at the time of Selma, but as President Obama said, our American journey is not complete. We all continue on the march to find the geography of equality. For the gay community, our bars have been a most important part of that geography.